The rakish oil tycoon of the American small screen, J R Ewing, is back. But in a new avatar. Larry Hagman, the actor who played the scheming Texas oilman on the long-running television show, Dallas, is reprising his role as Ewing in an advertising campaign to promote solar energy and SolarWorld, a German photovoltaic module maker. 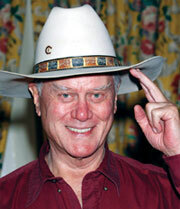 Hagman said the BP oil spill prompted him to bring back the Ewing character. “Since Sarah Palin is saying, ‘Drill, baby, drill’, I’m saying, ‘Shine, baby, shine.’ It’s a lot cheaper and cleaner,” said the actor who serves on the board of the US non-profit Solar Electric Light Fund.